Tinco Lycklama had a reputation for organizing great parties at his villa in Cannes. He was definitely an icon of the local ‘high society’. We know this as a fact before his marriage (1875) with Agatha Juliana thoe Schwartzenberg en Hohenlansberg. Indeed, we have two formal records about the parties organized by Tinco. One took place in December 1873, the other in February 1874. Below, we give some details about these parties. There is no doubt that Tinco and his wife continued to be active participants in the social life of Cannes. Newspaper articles indicate their participation in various events. Also, given that Tinco was the city’s great benefactor by offering Cannes its first museum (in 1877), it is obvious that he remained part of the local scene for the rest of his life. But, we have no trace about any further parties organized by the Lycklama. Perhaps Tinco became more “quiet” once married? Barely two years after marrying (1875), Tinco donated his collection to the municipality in December 1877. It included not only the thousands of souvenirs, art and other objects from his travels and acquisitions – it also comprised the collection which he bought (in 1874) from the estate of the late Edmond Ginoux de la Coche (including unique artifacts from Oceania and Pre-Columbian art – now all visible at the Musée de la Castre). (For background on Edmond Ginoux de La Coche (1811-1870), see Wikipedia…). That same year, they moved from the (large) Villa Escarras on the current rue de Latour-Maubourg to another Villa Escarras on the old chemin des Tignes. We also know that the young couple started to travel extensively, notably to Italy, in the subsequent years, and thus spent little time at their new villa. And, indeed, by the end of 1881, they move to a new home on the Chemin de St Nicolas. So, whereas the bachelor Tinco was previously holding lavish parties in the splendor of the Villa Escarras and surrounded by his collection, his later domicile – and marriage – were probably far more moderate (for what that means for these young rich aristocrats). The illustration above concerns the second party, held in February 1874. The painting (from the collection of the Musée de la Castre at Cannes) is by Pierre Tetar van Elven (1828-1908), a Dutch painter and personal friend of Tinco. Pierre was an avid traveler himself; though little is (currently) documented about his life, we know that he traveled through North Africa and also accompanied Tinco’s secretary Ernest Massenot on a trip to Beirut (this trip actually took place between the two recorded parties at the Villa Escarras). 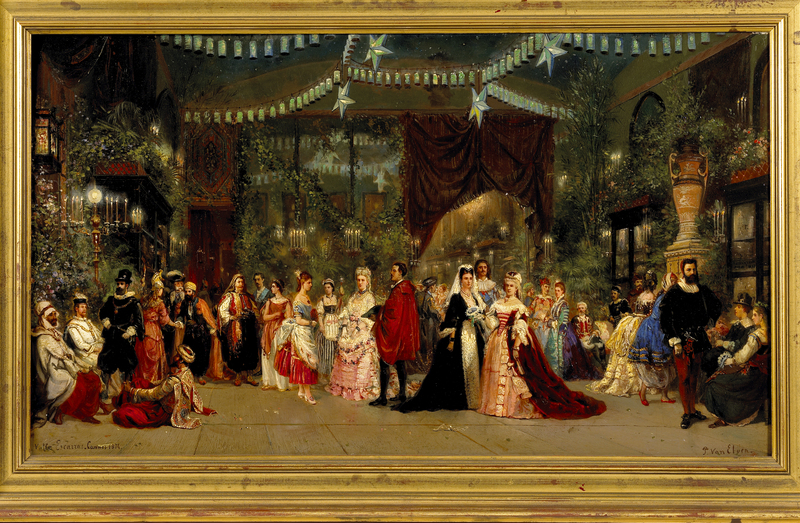 09/12/1873 (Tuesday) – Party at the Amphitryon of the Villa Escarras. Tibor Karolyi was a personal friend of Tinco Lycklama. He possessed a property in Cannes (reported in Courrier de Cannes, 14/12/1873).